BRIEF: Uppingham Town Council asked Qi to tender for a new project to provide a ‘one stop shop’ for Uppingham with equal appeal to the community and visitors to the town. 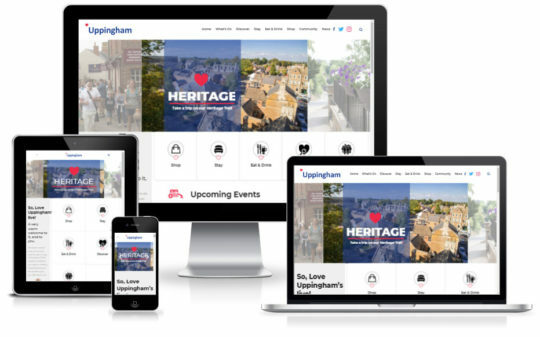 The new site was to contain a ‘at a glance’ listings of events and promotions the town as well as listings of businesses, community groups and retailers. The content was not only to generated by the council but also by the community on an ongoing basis. After being successful in the tender process Qi set about creating modern portal website that was able to display a wide range of content types simply and intuitively on devices big and small. The newly designed branding featured strongly throughout and was augmented with the creation of bespoke icons and web graphics. A Heritage Trail section was created with an interactive map that could be referenced in advance or used by visitors actively on the route. The content management system was set up so that the client could monitor and approve all uploads made by the public, when authorised the content was then set to publish on the site and also post to Twitter and Facebook automatically.